Today I have a heavily distressed furniture project. This look isn’t for everyone and I will understand if it isn’t one of your favorite makeovers. I wish I knew French so I could describe this lovely thing in beautiful flowery French. The style of the dresser and the drawer handles have me wanting to speak French. I spotted this beauty at a local thrift shop. I never have much luck at this shop but this time I hit the jackpot. The price was good, but was even better with my 30% off coupon! I think it was a ladies vanity in its past life but the mirror is missing. Just look at all the detail and the curved front middle drawer. Painting it blue with my own special mix. Who needs custom mixed paint. If you’ve been around here for a while you know I like to mix my paints together to get just the perfect color. I used Reclaim Bright-White on the drawer fronts. I brushed on two light coats. One of the drawers was in need of repair. My Technical Engineer (hubby) working on the drawer. A lot of times these old pieces need a little carpentry work. See, there’s a lot of work behind the glitz and glamour of painting furniture. My favorite thing…heavy distressing with 60 grit sandpaper and an electric sander. Do you notice the owl face on the drawer front. I planned it that way. I didn’t distress the body of the desk and I dry-brushed the hardware with the white paint. As you can see in this photo I didn’t completely cover the desk with the blue paint. She is beautiful!!! Great tutorial and I love how it turned out. Oh wow…Love the dresser!! I would love for you to link up at my party at Jillify It! It's going on now! Absolutely beautiful! Sweet and feminine! Love it! 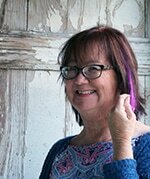 I would love for you to stop by my Creative Inspirations linky party to link up – the party is happening NOW! I hope to see you there! It looks wonderful. Isn't it fun?? To transform a piece into something special is just the best feeling. 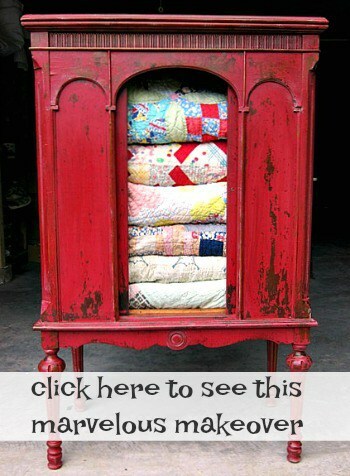 This is darling- sharing it on FB~ thanks for linking up at Feathered Nest Friday! Oh my goodness what an awesome transformation!! I found your blog through the hop. Glad I did!! Yes it is GORGEOUS. You've really got me in the mood to paint and try some of your 'look'. I just ran across your blog on Shabby Loco, and thought I'd come visit. It's been so much fun, I've become your latest follower and WILL BE BACK. Im new to blogland,,,only 3 weeks in, so I hope you'll come visit me as well, and maybe become a follower??? Thanks for sharing. 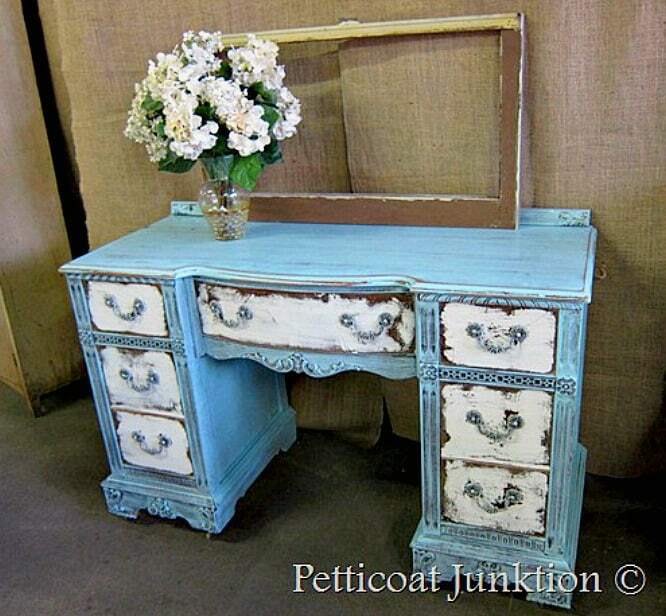 Gorgeous…I love how you just distressed the drawers. What a beautiful piece of furniture…tres Francais!! OMGEEE!!! i Lurv luv LURV it! Please oh please come link up at my “WTF Wednesday” Party! You will be the belle of the ball, honey! You can find me here… http://www.yogatations.com Wrong link on my name. Sorry! Oh so very very cute!! ooh she is a beauty! i love that look! wow!! terricfic! unbelievable what a transformation!! Yes..it definitely looks very French!! It's gorgeous! I'm afraid of distressing too heavily, usually–but I love the look you achieved! I love the vanity, my mom use to have one like it but I don't know what happened to it. You have a great bunch of blogs. Thanks for posting. Thanks so much for participating in the blog hop! Thanks Sue for the correct spelling of magnifique! Your vanity turned out great Kathy! I love her in her new french do! Love the paired colors and the distressing!